Matt Shaw has a warped mind. Pick up one of extreme horror novels and he will prove it to you. Shaw manages to walk a thin line. His horror is shocking, disgusting, and visceral without ever crossing the line into absurdity the way of Edward Lee or Ryan Harding can. Much of this success is due to the raw and unpolished nature of Shaw’s narratives which often defy literary norms to pull of some of the most unexpected twists imaginable. 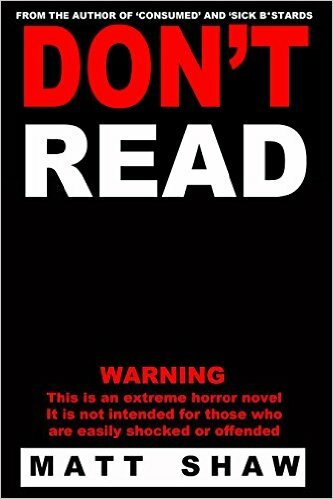 Don’t Read is a recent novella by the author. It is the story of a truck driver known only as Chris. Chris has decided to write a horror novel. He believes that in order to make a book believable the author must draw from real life experiences. To write his masterpiece, Chris has taken off on a cross-country killing spree. The novella begins after Chris has already killed and raped several women. Over the course of the killing spree, many more will die as Chris refines his craft, both as a writer and as a serial killer. The deaths visited upon Chris’s victims are far from the typical horror fare. Matt Shaw should be given an award for penning the most unusual and disturbing death involving cement ever devised. There is also a succinct description of how the fluid within the eye tastes that is both believable and vomit worthy. How does he come up with this stuff? And who in their right mind would publish it? The answer to the latter question is simple. Matt Shaw self publishes his own writing. Indeed, he is a testament to how successful self-publishing can be. Shaw has now published nearly 100 distinct works and he continues to put out stories at an alarming pace. Some, such as Art and Sick B*stards, have met with critical praise and financial success. However, the new novella will likely not succumb to a similar fate. Don’t Read is an excellent example of self-publishing’s major woes. It is poorly edited with numerous typos throughout. Characters and plot are underdeveloped with the story coming to an abrupt end which fails to address the fate of our serial killer. In essence, Don’t Read is a rush job meant to set up a potential sequel. While Matt Shaw’s unpolished writing has served him well in the past, it should be getting better not worse. The quality of Don’t Read is well below the bar set by the author’s earlier works. This is not to say Don’t Read does not have any merits. It is as disgusting as anything else Matt Shaw has ever written, but with about 100 other stories out there is plenty to choose from.